Using two quadrant choppers a reversible drive can be achieved, because this combination allows reversal of both current and voltage of the motor termi­nals. We can get a regenerative reversible drive. The motor can operate in all four quadrants. A scheme of a Reversible Drives using Choppers is shown in Fig. 4.85(a). The modes of operation are illustrated in Fig. 4.85(b). The operation in both the directions is achieved by operating the choppers 1 to 4 to provide voltage and current of desired polarity. 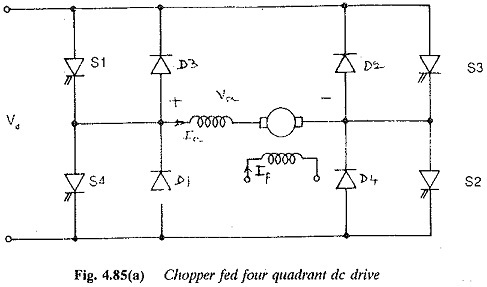 Control of choppers S1 S2 with their diodes D1D2 provides operation in I and IV Quadrants with positive current and reversible by varying TON/TOFF ratio. S3S4 with diodes D3D4 comprise another chopper providing operation in II and III quadrants with negative current and reversible Va. Thus the load voltage and current can take up both possible directions. The circuit has similar behaviour of a dual converter made up of two antiparallel connected fully controlled line commutated converters. The choppers can also be controlled as regenerative choppers (step up choppers). To achieve this S2 is always ON and S3 OFF. The choppers S1 and S4 are controlled to provide positive Va and reversible load current. This corresponds to operation in I and II quadrants. The operation in III and IV quadrants can be accomplished by making S4 always ON, and S1 OFF with control on S1 and S2 to make Va negative and Ia reversible. The modes of operation are shown in Fig. 4.85(c). Four quadrant operation can also be obtained with a two quadrant chopper supplying the armature and using a scheme for field current or armature cur­rent reversal. This scheme involves fewer power components. The response is very sluggish, as has already been discussed. Closed loop control systems are being developed to obtain a precise control of speed with regeneration in both directions for thyristor drives. 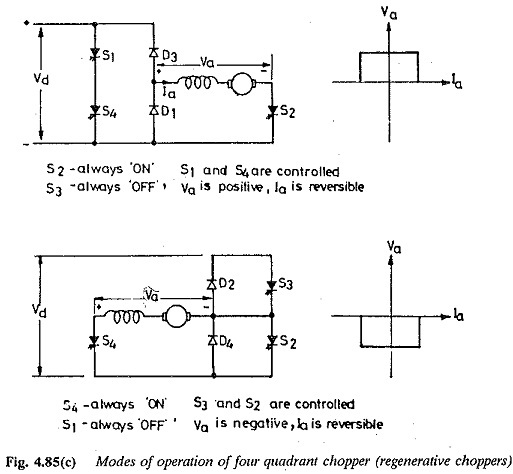 A comparison of a reversible drive using a dual converter and a four quad­rant chopper is rather interesting. A four quadrant chopper is costlier than a dual converter. 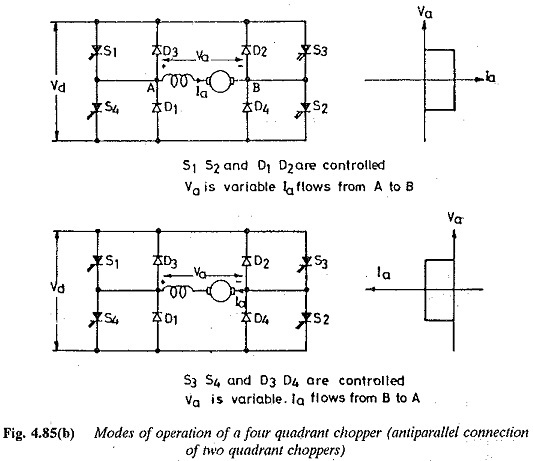 This is because of commutation circuits required by each chopper. A dual converter has a simpler control, if circulating current is al­lowed. A detailed investigation may be required to compare the performance of the drives under dynamic and steady state conditions.